It’s essentially true that if you give a marine diesel engine clean oil, clean air and clean fuel, it will run, if not forever, then certainly for longer than you are likely to own your boat. Using good-quality diesel oil and changing out the oil and oil filter at the manufacturer-recommended time intervals—typically every 200 hours—is a good first step. Similarly, if the air intake is correctly located and kept free of salt particles, the air flowing into the engine compartment will provide good combustion at the same time it helps cool the engine. The challenge, then, is to make sure the engine always has clean, water-free fuel. The precision parts in a diesel fuel injection system, in particular, will not tolerate the presence of any kind of abrasives. Nor do they like fungi and bacteria, both of which can thrive in an environment of diesel fuel and water. Dirt can arrive in your tank via contaminated fuel or as a result of microscopic airborne particles getting in through the air vent. Water can get into your tank if it comes from an impure source (especially fuel drums) or through a leak in the gasket or O-ring of your boat’s fuel-tank filler plate. The diurnal exchange of humid air in and out of your tank can also introduce water in your fuel, especially when the tank is only partially full. Specifically, when the ambient temperature drops below the dew point, any vapor in your tank will condense into water. Eventually, a puddle of water will form at the bottom of the tank, which creates a water-diesel fuel nirvana for the various bacteria (usually referred to as “diesel bugs”) and fungi that thrive in this environment. If these critters are left untouched, they can create a goo that will block fuel lines and filters and possibly damage the fuel tank and its fittings. To prevent this from happening, be sure to add a biocide whenever taking on fuel. Removing particulate matter is pretty straightforward. To trap grit, run the fuel through two fine-pore filters: typically a 30-micron filter element in the primary off-engine fuel filter/water separator and a 2- or 5-micron filter on the engine itself. 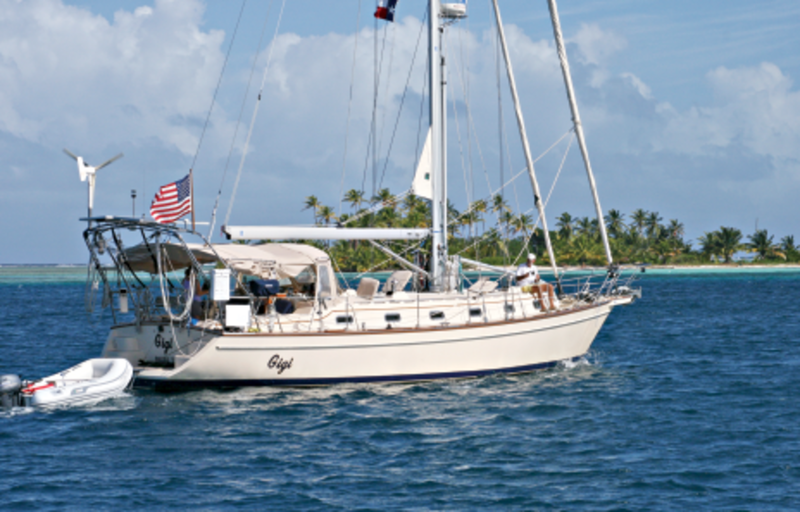 An especially effective way to keep contaminated fuel from reaching the engine is to install an additional fuel pump that will circulate the fuel through the primary fuel filter/water separator—or a separate filter unit entirely—when the engine is not being used, including those times when you are under sail. The name for this kind of off-line fuel cleaning has come to be known as “polishing.” Although the term has become a part of the lexicon, I’m not crazy about it because I don’t know any way one can really “polish” a liquid. While it is true that you can remove impurities, grit, water, bugs and the like, doing so doesn’t make the fuel smoother. Nonetheless, it is always a good idea to have repeated mechanical filtration. Although it depends on your particular fuel system, you should get good results by filtering the fuel in your tank once or twice a week. These kinds of filtering systems can be bulkhead-mounted, with time controls, diesel pumps of varying capacities and single or multiple fuel filter/water separators. For most sailboats, I like the new Parker Racor FPM-050 unit, because its electric pump can move up to 80 gallons of fuel through a boat’s existing primary fuel filter/water separator every 24 hours. The unit’s power consumption is about 1 watt @ 12 volts DC, or 0.08 amps, a trifling amount that can easily be supplied by a 5-watt solar panel and a small storage battery. 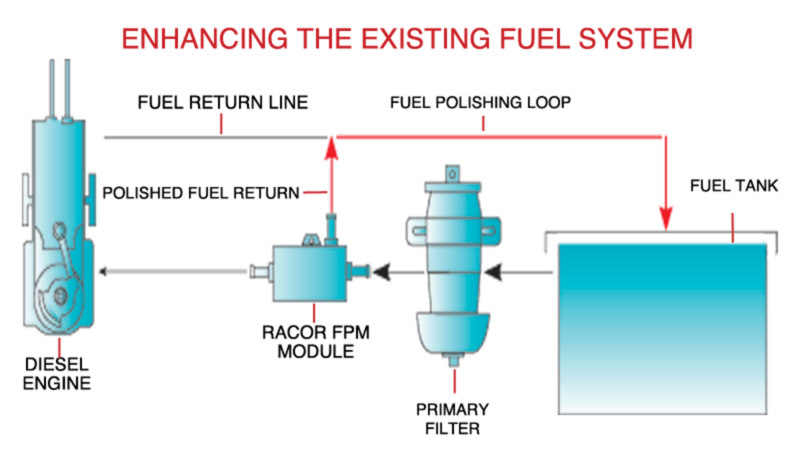 Installing the unit involves cutting the fuel line hose from the output side of the primary filter and connecting the ends to the pump’s inlet and outlet. Tee the fuel return hose into the fuel return line leading to the tank and then connect the two wires to the 12-volt power source. When the power is turned on, fuel will flow through the unit. When it is off, normal flow to the engine is restored. An optional solid-state, self-powered timer is available, but most installations will run just fine if they have a solar panel in place and the sun is shining. After you’ve installed the secondary filtration system, run it for about a week and then remove and inspect the filter element in the primary filter/separator. Unroll the pleated filter paper from the filter and check for signs of dirt or goo. Put a few drops of household bleach on any dirty surfaces. If the color changes, you can be reasonably certain that you have a diesel bug problem. If the color doesn’t change, you can be pretty sure the material is dirt. If you find you do have diesel bugs, insert a thin plastic tube through the tank’s access port, using any tubing that will not be dissolved by the fuel. Remove the contaminated fuel from the bottom of the tank—take between a quart and a gallon depending on tank size—and put it in a clear container and let the fuel sit for 30 to 40 minutes, or until it settles. Check for water underneath the diesel fuel; a separation line between the two will be obvious. Installing an off-line filtering system is a straightforward project but many owners decide it is not worth the effort and rely on luck. Unfortunately, when it comes to being sure you have clean fuel, luck has nothing to do with it.